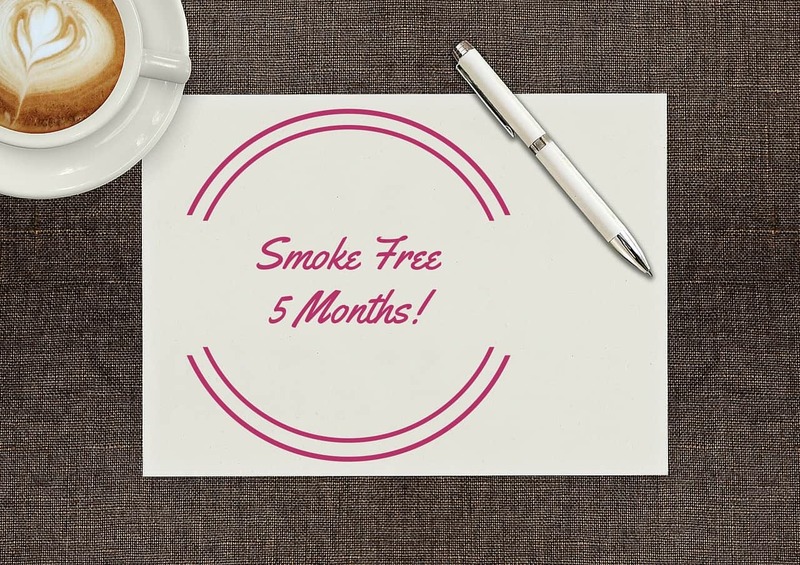 Smoke free: 5 months! - Me, him, the dog and a baby! I honestly cannot believe I am writing this post. If you had asked me last year there is no way I would have said that I could quit smoking. So, anyone who actually follows this blog will know that my daughter is now 5 months old, meaning no, I didn’t give up smoking while I was pregnant. I tried a few times and I just couldn’t do it. I was really ill during pregnancy and smoking seemed to be the only thing to get rid of the sickness and heartburn at times. I wish I could have given up while I was pregnant though, I just wasn’t strong enough. I was actually sort of forced into quitting smoking. I had a terrible time after Erin’s birth and was in hospital for 2 weeks and was extremely ill. I wasn’t allowed to eat or drink most of the time, let alone smoke, not that I actually even thought about smoking during those 2 weeks. On the day before I was discharged I did try smoking and I hated it. I just didn’t like it any more which was really strange. I also tried a couple of times once we were home from the hospital but I quickly realised I really didn’t want to smoke any more. If Erin’s birth hadn’t been so traumatic for me things might have been different. I am so, so, so glad that I am 5 months smoke free though. Not only would smoking have affected my time with Erin but I also feel so much better for it. I don’t get as tired as I used to. I feel healthier. I don’t always have a cough. My husband is pretty damn happy that I’ve finally quit as well. I started smoking as a teenager and it’s honestly the worst thing I ever did. My life was ruled by smoking for so long and it’s such a good feeling to be free from that. No longer will I dread a flight or train journey because I can’t smoke. I don’t have to think about if I can or can’t smoke somewhere any more. I do still feel like I want a cigarette a lot of the time but I would never try one now. Having smoked for around 15 years I thought I would never be able to quit but it really is possible. Okay, I had an easier start to it than most people because I was unconscious for 2 weeks pretty much but it has still taken a lot of willpower since then.